Toast cumin seeds in a small pan for a few minutes, until the seeds release their aroma and lightly browned. Using a mortar and pestle, pound them coarsely. Repeat with the coriander seeds. Place chicken in a large bowl with garlic, thyme, parsley, chile, cumin, coriander and paprika. Using your hands, toss chicken and spices together to coat chicken well. Cover and refrigerate at least 4 hours, preferably overnight. Remove chicken from the refrigerator 30 minutes before cooking, to allow it to come to room temperature. After 15 minutes, season chicken on all sides with 1 tablespoon and 1 teaspoon salt and lots of freshly ground black pepper. Preheat the oven to 325°F. Heat a large sauté pan over high heat for 2 minutes. Every so often, swirl oil and rendered fat around the pan. Turn the legs over and reduce the heat to medium. Cook 2 more minutes on the second side. Arrange the chicken (in one layer) in a braising dish. The chicken legs should just fit in the pan. Pour off some of the fat and return the sauté pan to medium heat. Add the onion, fennel, and bay leaves. Cook 6 to 7 minutes, stirring often, until the vegetables are lightly caramelized. Add tomatoes and cook another 5 minutes, stirring and scraping with a wooden spoon. Add sherry vinegar, white wine and sherry. Turn heat up to high and reduce by half. Add the chicken stock and bring to a boil. Add cilantro and pour broth and vegetables over chicken, scraping off any of the vegetables that have fallen on the chicken back into the liquid. The liquid should not quite cover chicken. Cover pan very tightly with plastic wrap (yes, it can go in the oven) and then aluminum foil. Braise in the oven for about 1 1/2 to 2 hours. To check chicken for doneness, remove plastic and foil, being careful of the steam. Pierce a piece of the chicken with a paring knife. If the meat is done, it will yield easily and be tender, but not quite falling off the bone. Turn the oven up to 400°F. Transfer chicken to a baking sheet and return it to oven and brown for about 10 minutes. Strain the broth into a saucepan, pressing down on vegetables with a ladle to extract all the juices. If necessary, reduce broth over medium-high heat for about 5 minutes, to thicken slightly. Bring a large pot of heavily salted water to a boil over high heat. Add the couscous and cook 8-10 minutes, until tender but still al dente. Drain couscous, return it to pot, tossing with the butter and parsley and a pinch of pepper. Taste for seasoning. Toast saffron in a small pan over medium heat until they are dry and become brittle. Be careful not to burn the precious saffron. Pound the saffron in a mortar to a fine powder. Dab a tablespoon of the butter into the saffron powder, using the butter to pick up all of the saffron. Heat a large sauté pan or Dutch oven over medium heat for two minutes. Add the olive oil, remaining butter, and saffron. When butter foams, add onions, bay leaf, chile, thyme, 1 1/2 teaspoons salt and some pepper. Cook for 8-10 minutes, stirring often, as onions wilt. Turn heat down to low and cook another 20 minutes, stirring every now and then, until the onions are soft and sweet. Taste for seasoning. Pit dates and slice them thinly lengthwise. Toss them with olive oil, lemon juice, parsley and cilantro. Season with 1/2 teaspoon salt and some pepper. Place hot couscous on a large warm platter. Spoon saffron onions over it and arrange chicken on top. 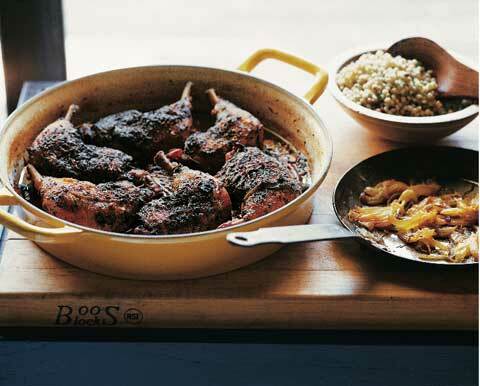 Ladle some of the juices over chicken and top each leg with a spoonful of date relish. Serve the extra broth and date relish on the side. Note: The chicken is even better braised the day before and it needs to marinate a day ahead.